Joe Pignatano was almost out of baseball within a month of his debut. Instead, his mother intervened and he enjoyed 38 years in the game, 27 of those in the majors as a player and coach. He was the bullpen coach for the 1969 Miracle Mets, and the backup catcher to John Roseboro on the 1959 Cinderella Dodgers team that upset the Braves in a playoff and knocked off the White Sox in the World Series. As a reward, Pignatano was released a few days later and was sent back to his home in Brooklyn with a check for $127 and no cash in his pocket. Pignatano traveled 27 hours without food since he could not cash the check. He was sleeping in a train station in Chicago when a cop roused him and told him he couldn’t sleep there. “I explained that I had no money and was catching a train in the morning,” said Pignatano. The police officer then took Pignatano to a hotel, paid for the room, and made sure he would be awakened in time to make his train. Once home in Brooklyn, he explained what had happened on the trip to his mother, Lucy. Mrs. Pignatano could not believe the way her boy had been treated and immediately called the Dodgers offices and spoke with Fresco Thompson, who was Brooklyn’s minor-league chief. When she identified herself, Thompson congratulated her on how well Joe was doing. “He couldn’t be doing that well,” Lucy Pignatano said. “He’s sitting right next to me.” Mrs. Pignatano related Joe’s story to Thompson, who immediately asked Joe to come to Ebbets Field. At Ebbets Field, Pignatano worked out for some local Dodgers scouts, including head scout and Hall of Famer George Sisler. At the end of the workout, Sisler asked his staff to explain “why we would release this player.” No one could, and soon Pignatano was on his way to seven teams in seven leagues: Cambridge, Valdosta, Asheville, Elmira, Fort Worth, St. Paul, Montreal, and eventually Brooklyn. Pignatano was born in Brooklyn on August 4, 1929, and always kept the borough as his home. He loved sports and was a “pretty good athlete.” Growing up in the 1930s and ’40s in New York, the only sports he played were baseball, softball, and stickball. He became a catcher because no one else wanted to do it. When the Dodgers offered him a contract he was ecstatic. “Playing for the Dodgers was the pinnacle,” he said. His minor league career, after the hiccup in Cairo, was essentially a straight line up the ladder. His stop in the Texas League in 1955 was notable in that Pignatano hit just .199 but was still promoted to St. Paul in the American Association for 1956. 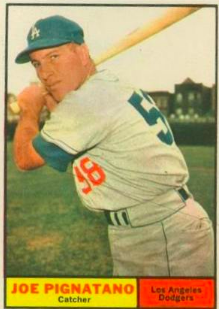 He hit .295 for the Saints, following that up with a .299 performance in 70 games for Montreal in the International League in 1957 before getting his shot in Brooklyn. “The Texas League was a pitcher’s league then,” Pignatano explained. “Only a few guys hit over .300. I got off to a rough start and didn’t recover until I got to St. Paul.” Indeed, Maury Wills was Pignatano’s teammate at Fort Worth, and the future National League MVP hit just .202 with only 12 steals. Six Texas League players hit .300 with more than 400 at-bats that year, but none spent as much time in the show as Pignatano or Wills. The highlight of Pignatano’s time in Brooklyn was catching the last five innings of a Danny McDevitt shutout in the last game played at Ebbets Field. “I didn’t realize we might move until the last week,” Pignatano said. “Everyone in Brooklyn blamed [Dodgers owner Walter] O’Malley then, but it was really [City Planning official Robert] Moses. He thought O’Malley was bluffing and wouldn’t arrange for him to purchase land at the site he wanted to build a new stadium.” Pignatano and McDevitt reenacted the final major league pitch in Brooklyn before a game by the Mets affiliate Brooklyn Cyclones at Key Span Park on June 24, 2007. That was the year the Dodgers rebounded from a seventh-place finish in 1958 to win the World Series. “That year was the highlight,” Pignatano said. He replaced Roseboro for the last three innings of the pennant clincher against Milwaukee as Game Two of the best-of-three playoff went into extra innings. In the decisive 12th frame, Pignatano singled with two outs and Gil Hodges on first base, setting up the Carl Furillo hit that, with the help of a throwing error by Felix Mantilla, brought home Hodges with the pennant-winning run. “I can still hear Vin Scully’s call, ‘We’re going to Chicago,’” said Pignatano. That hit followed a key sequence in San Francisco about two weeks earlier. The Dodgers came to Seals Stadium for a three-game series trailing the Giants by two with nine games left. Behind 1-0 in the seventh inning in the second game of a September 19 doubleheader, Pignatano walked with Don Demeter on second and Wills on first and one out. Chuck Essegian then hit a double play ball to Jim Davenport at third. Pignatano came into second base hard and hit Daryl Spencer, who dropped the ball on the pivot. Demeter scored and everyone else was safe. The Dodgers went on to score four more runs on doubles by Jim Gilliam and Charlie Neal, and won the game 5-3, keying a three-game sweep. The play by Pignatano was highlighted in the next issue of Sports Illustrated. The breakup of that double play, the single in the playoff, plus an inning behind the plate in the Dodgers’ Game Five loss in the 1959 World Series were the top moments of his time in Los Angeles. According to then-General Manager Buzzie Bavasi, the team’s need for cash to complete Dodger Stadium and the emergence of Norm Sherry as the preferred target for Sandy Koufax led to the sale of Pignatano to the Kansas City A’s in January of 1961. A’s catching duties were split that season between Pignatano and Haywood Sullivan. “I enjoyed Kansas City. I hit well for awhile and (owner Charlie) Finley took care of us. As long as I had a uniform I really didn’t care where I was.” It was the only season in which Pignatano played in more than 90 games or had more than 200 at-bats. Pignatano split 1962 between the Giants and the Mets. He played just seven games for San Francisco before his sale to the Mets on July 13. “Alvin Dark never cared for me,” Pignatano said of the time he backed up Ed Bailey and Tom Haller. With the Mets, Pignatano played out the string and hit into a triple play in his last big league at-bat on September 30. By then, he knew the end was near. “My arm was hurting, the fastball was starting to get by me, and I had a sense that it was about over,” he said. Pignatano spent 1963 and 1964 in the International League with Buffalo and Rochester. His 1964 Rochester club won the International League championship, and Pignatano was invited back for 1965, but the accumulating aches and pains led him to walk away. Pignatano worked for the Senators from 1965 to 1967 before following Hodges to New York. Yogi Berra was established as first base coach on the Mets, so Pignatano moved to the bullpen. “My job was to work with the relievers, make sure they were ready, and advise Gil,” he said. Pignatano’s most famous contribution may have been the vegetable garden he nurtured in the Mets bullpen. “In 1969 I discovered a wild tomato plant in the bullpen and nurtured it the rest of the season,” he remembered. “We got some tomatoes off it, but most important we won the whole thing. After that, I kept up the garden as long as I was with the Mets as a good luck charm.” Pignatano feels the turning point of the 1969 season was a September game at Shea Stadium against the Cubs. Tommie Agee had been knocked down in the first inning, and Jerry Koosman retaliated by drilling Ron Santo on the arm. While Santo continued to play, he was less effective and the Mets passed Chicago to win the division title. “Koosman sent a message, especially to Leo [Durocher, the Cubs manager]. Leo started the whole thing,” Pignatano said. Interviews with Joe Pignatano, 2007, 2009. All quotations attributed to Joe Pignatano come from these interviews, except the final one which comes from Chuck McAnulla, “Sports Collectors Digest Profile: Joe Pignatano,” Sports Collectors Digest, March 22, 1996: 170-2. Email correspondence with Buzzie Bavasi.